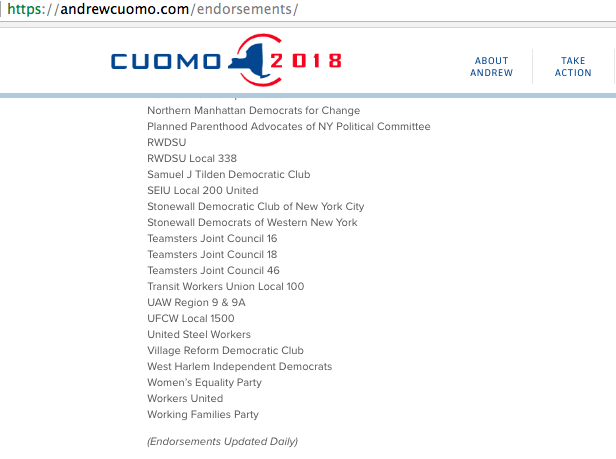 Governor Andrew Cuomo’s campaign website has been updated with a 2018 logo but was touting dozens of endorsements that the governor received in the 2014 election cycle, with no indication that the backing of the groups listed did not apply to the current election, in which the Democrat is seeking a third term. The Cuomo campaign took down its endorsement page, which said “endorsements updated daily,” on Thursday after Gotham Gazette inquired about it. Shortly after an email to a campaign spokesperson, sent after several calls to organizations listed, the campaign endorsements page began redirecting to the home page. Until Thursday afternoon, the governor’s campaign website touted 51 endorsements, from prominent labor unions, Democratic clubs, progressive advocacy groups, and political parties like the Women’s Equality Party and the Working Families Party. But at this point, almost all of the endorsements only apply to the governor’s last election in 2014 -- most of the groups have yet to make a choice of candidate this year. A few have already backed Cuomo again this year, when he is facing actor and activist Cynthia Nixon in the Democratic primary, while a few Republicans are vying for their party’s nomination, and smaller party candidates are likely to emerge soon. The WFP backed Cuomo in 2014, in a deal brokered by Mayor Bill de Blasio, after the governor agreed to push progressive priorities, including through support for a Democratic majority in the state Senate. Cuomo failed to follow through on some of those promises, prompting wariness and criticism by WFP members and scorn from de Blasio, while the governor also created the Women’s Equality Party (WEP) in a thinly-veiled attempt to undercut the WFP. Though Cuomo has generally tacked to the left in his second term, after governing as more of a centrist Democrat, the political winds in the state have shifted dramatically since 2016. The election of President Donald Trump enraged progressive activists who on a local level are targeting the Republican-controlled state Senate, which they see as the largest roadblock to major progressive legislation being passed in the state. The Republicans are propped up by the Independent Democratic Conference -- eight breakaway Democrats who share power in the Senate -- and by Senator Simcha Felder, a nominal Democrat who caucuses with the GOP. Cuomo, who has in some ways benefited from (and some say propped up) that Senate structure, has increasingly become the target of progressive advocates’ ire. Nixon’s entrance into the race earlier this week has added a dramatic new element to the gubernatorial race, apparently pushing Cuomo to quickly pursue several endorsements as she runs to the governor’s left and could pull support from groups that have traditionally supported him. The governor does already have a few prominent backers for his third-term bid. In January, the Retail, Wholesale and Department Store Union became the first labor union to endorse the governor for a third term. “At a time when we have serious concerns about what is going on in Washington, DC, Governor Cuomo has proven that you can govern effectively, and advance progressive change in a unifying manner,” said RWDSU President Stuart Appelbaum, in a statement at the time, touting Cuomo’s progressive accomplishments including the passage of the state’s marriage equality bill, paid family leave, and a $15 minimum wage, among other things. 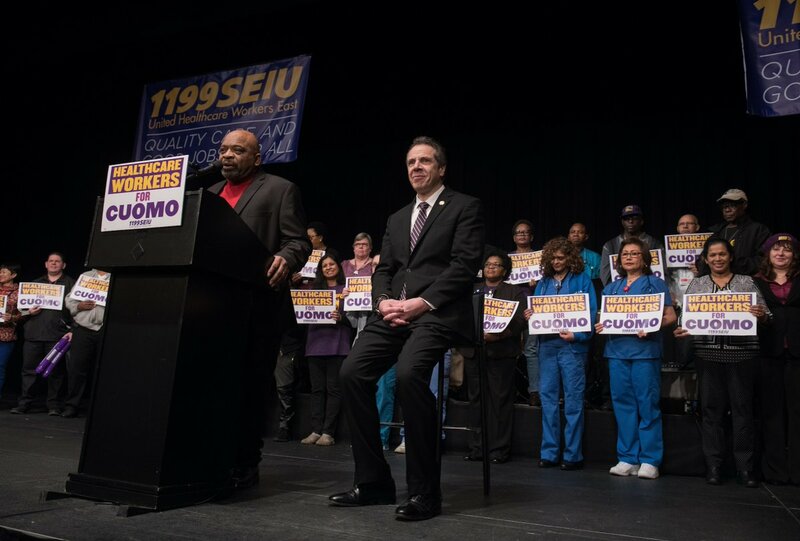 The large and powerful health care workers union, 1199 SEIU, has also backed Cuomo. And, last week, the National Organization for Women-New York also came out in support for Cuomo and, just Tuesday, U.S. Senator Kirsten Gillibrand of New York also endorsed him, as reported by The Daily News. Have an issue you want addressed in Albany? Perhaps you’d like the state to legalize your new multi-million dollar venture into the “sharing economy” -- one that terrifies existing business interests and labor unions; maybe you want to change the protections offered by New York’s civil rights laws; or maybe you want in on the hundreds of millions of dollars the state allocates to economic development programs. No matter the issue, you’re going to want Governor Andrew Cuomo, the most powerful person in New York, on your side. Cuomo, a Democrat known to get his way in Albany, is revered by many for being able to dictate terms to the state Legislature on controversial issues and accomplishing what could not be accomplished by others, once he sets his mind to it. But while the governor sometimes has his own pet issues that he pushes with intensity, he often doesn’t come along easily on a cause. And if campaign finance filings are any indication, Cuomo doesn’t often move without significant campaign donations either before or after the fact. A lot of the time the notoriously prickly governor, whose administration has been known for its “get along or kill” approach, won’t get behind an issue without a fight. But taking Cuomo on in any public way comes with serious risk and can have major consequences. Those, whether deep-pocketed or not, interested in seeing the governor support an issue he is not immediately draw to must wrestle with the best approach to lobbying Cuomo. As government is a continuous stream of policy and program decisions, there are no shortage of interested parties pushing their causes, and the governor often has the final word, legislators, labor groups, lobbyists, and others often must decide what combination of tactics is best to convince Cuomo to back a proposal. Gotham Gazette spoke to a number of lobbyists and heads of issue-focused campaigns about what a successful lobbying effort needs in order to get the right kind of attention from Cuomo. As this article is published, public education advocates are finishing a walk from New York City to Albany to push for school funding and the governor continues to weigh whether to sign a bill that could crush Airbnb in the state. These are just two examples of current issues where people are trying put pressure on the governor to act. For the former, teachers-union-backed advocates have jousted with Cuomo to the point of hostility. On the latter, those who want to see Cuomo sign the bill regulated Airbnb have mostly left him alone publicly, while Airbnb has more outwardly sought to make its case for a veto. Looking ahead to 2017, there will be no shortage of issues where interested parties will be trying to convince the governor and the Legislature to act one way or another, from upstate Uber legalization to the cap on charter schools and much more. To court just about any elected official, you need at least one of: a ground game, as in grassroots supporters willing to demonstrate publicly and able to grab media attention, or at least the appearance of one; a money game, as in the ability to show that your cause has the attention of large campaign donors; and a behind-the-scenes game, as in the ability to influence insiders, which many include consistent, even constant, lobbying and contact with key administration officials. The ground game and the money game usually indicate, to varying degrees, that you have some semblance of solid rationale to your proposal. Along with these basics, lobbyists have to consider the nuances of Gov. Cuomo’s personality and long history in politics. Known as a master strategist, Cuomo is also seen as flexible on many of his political stances because he, like many governors, tries to combine being socially liberal and fiscally conservative. The key with Cuomo is often showing him how the proposal fits his image and gives him a chance to be big and bold. Cuomo is not shy about wanting to be first on issues. Cuomo likes, of course, to move on things when he’s ready to, and when they make sense for him politically and for the state generally. He is keenly aware of his political standing among key constituencies and of what it takes to remain in power. With six years as New York’s chief executive, it's become clear to a number of lobbyists that the best way to get Cuomo onboard with a policy proposal is to present a campaign that has everything: grassroots supporters who can promote an issue and also make life miserable for the opposition; big-money donors who can support major campaign efforts; and a lobbying apparatus that works behind the scenes to sway legislators. Cuomo has made his name as Governor by joining with these type of efforts, from marriage equality to the minimum wage. Including several recent examples, the governor does appear susceptible to loud outcry by a group of advocates, whether it is on police killings of unarmed civilians, allocating affordable housing funds, or a moratorium on fracking. “The most successful lobbying efforts in New York combine grassroots supporters with major donors,” said John Kaehny, executive director of Reinvent Albany, also a government reform group. When Cuomo ran for Governor in 2010, he was far from an outspoken supporter of marriage equality, but early in his term it became clear that several major donors were interested in advancing the policy behind the scenes, while activist groups were more than willing to press the issue publicly. Essentially, it would also give Cuomo a chance to make big, national news. A vote on marriage equality had failed by inches under Gov. David Paterson and advocates weren’t ready to give up. Cuomo initially feared the same kind of embarrassing result that befell Paterson -- left standing on the state Senate floor with dissapointed legislators. According to two sources involved in the campaign, Cuomo saw the opportunity to lead on a national issue while endearing himself to his liberal base at the same time he was angering other parts of that base by advancing fiscally conservative measures. When Cuomo decides he wants to accomplish something - no matter how much cajoling it takes to get him there - he goes after his goal aggressively. The Cuomo administration and a number of wealthy donors, including hedge fund managers Dan Loeb and Cliff Asness, quickly began the work of wooing Senate Republicans to their side, and by June 24, 2011 Cuomo had the votes he needed to pass marriage equality in New York. The administration monitored the floor vote in the Senate obsessively, interjecting at times to ensure Senate Republicans would not renege on their promise to bring the bill to a vote and to show sensitivity to the Republican members who had made what would be a career-ending decision to vote for it. The proceedings were so tightly choreographed that most Senate Democrats who supported the bill were not allowed to speak about it. When the final votes were cast Cuomo took to the airwaves to claim credit for a successful campaign that a year before he seemed uninterested in. Donations from grateful supporters of marriage equality swept into Cuomo’s campaign coffers before and after the vote. The Empire State Pride Agenda gave Cuomo $60,000 in May 2011; Loeb gave Cuomo $19,367 in 2012; and a number of marriage equality supporters organized high-dollar fundraisers for the governor. The governor has repeated these kind of issue campaign takeovers in years since, showcasing the power of his elected position with the virtually unmatched will and desire for big accomplishments possessed by the officeholder. That feeling was reinforced in 2015 when Cuomo suddenly paired with the Service Employees International Union (SEIU) “Fight for $15” to champion a minimum wage increase he had once dismissed as fantasy. Cuomo was working alongside some of his biggest critics from the left, like Michael Kink and Citizen Action and other Working Families Party members, while touring the state in a recreational vehicle paid for by unions. The governor, who at times in the past was the target of angry Fight for $15 rallies, was now attending them and hosting streaming video of them on his website. Labor groups poured nearly $2 million into the Mario Cuomo Campaign For Economic Justice - most of the cash from SEIU and its various committees and affiliates. SEIU is also a consistent donor to Cuomo’s reelection campaign and the campaigns of his allies. The Fight for $15 had gotten the governor on board after showing a groundswell on the issue, with the power of active and deep-pocketed labor unions, and in the wake of an embarrassing challenge from the governor’s left in his 2014 re-election. Big name Democrats were also taking up the issue and becoming heroes to significant blocs of Democratic voters. While large public campaigns that involve the governor have clearly been effective, perhaps the most impactful lobbying of Cuomo is done almost completely out of public eye. Multiple lobbyists point to Cuomo’s relationships with 1199-SEIU, the powerful hospital workers union, and Jennifer Cunningham of the firm SKD Knickerbocker as ideal arrangements for an issue-focused organization and a lobbyist looking to move their agendas in New York. Cunningham has been labeled “The Most Powerful Woman in Albany” and was an adviser to Cuomo during his early years as Governor. Cunningham and 1199 annihilated Paterson’s ambitions to run for election in 2010, unleashing a brutal $1 million a week advertising campaign in response to his proposed $3.5 billion cut to the state’s Medicaid program. Cunningham declined to comment or be interviewed for this article. Cuomo has handled the union much differently than many others, giving it a seat at the table when cuts are proposed and rarely, if ever, having any public conflict with it. Most lobbyists and issue groups don’t have an operation anywhere near the scope of 1199-SEIU, and over the last two years smaller advocacy groups have been confronted with how to lobby the administration on limited resources. For groups pushing for criminal justice reform and for state government to fund supportive and affordable housing, for example, lobbying the administration in a friendly manner failed initially and they took the risk of confronting the governor publicly. Shelly Nortz of Coalition for the Homeless said that 2014 efforts to get the Cuomo administration to deliver on supportive housing funding. The group continued to pressure Cuomo, working with and praising Mayor Bill de Blasio, Cuomo’s rival, for his supportive housing initiative in 2015, and then getting more and more vocal calling for Cuomo to do what they said was his part. The Coalition and its allies were encouraged when Cuomo prioritized funding to fight homelessness in his 2016 State of the State address, but when the governor and the Legislature failed to agree on how to distribute it, Nortz’s group kicked the public pressure campaign into high gear. “We’ve been having a presence outside the governor’s office,” Nortz said of regular rallies to call for release of the funds set aside in the state budget. As the group and other members of the NY/NY Housing coalition have issued press releases and done interviews on the subject, sometimes harshly criticizing Cuomo, the governor’s office has reacted in various ways. At one point, an administration spokesperson said that the governor hadn’t intended to sign the memorandum of understanding (MOU) that would distribute the housing funds this year and instead expected to do it next year. After being rebuffed, the administration tried a different path: releasing an MOU approved by the administration, essentially to move the ball into state legislative leaders’ court. The MOU wasn’t signed by either legislative leader, but it was an indication that the administration was squirming under the pressure brought by housing groups. Criminal justice reform advocates describe having to pull Cuomo forward kicking and screaming to ensure oversight by a special prosecutor in instances of police killings of civilians. In 2015 the governor felt pressure from the mothers and family members of civilians killed by police, black and Latino legislators, and major advocacy groups. Unable to move the Legislature to action during session, activists didn’t let go, instead amplifying their calls for the governor to do something. On July 8, 2015 Cuomo announced an executive order giving the Attorney General jurisdiction to investigate police killings of civilians. The move angered many conservatives and law enforcement officials across the state, but pleased many activists and elected officials, especially legislators of color, many of whom joined Cuomo at the signing of the order. Advocates involved in the push say they believe they were successful in moving Cuomo because the governor is particularly sensitive about his most concentrated voting base, which consists of African-Americans from New York City. Furthermore, Cuomo was able to claim that he was “the first” governor to take action on what was coming into focus as a major national issue. While the executive order was a victory for advocates, their momentum has stalled since. Cuomo has acknowledged that he would like to see legislation to make a special prosecutor permanent in such cases, but he has not pushed the issue with the Republican Senate Majority, where opposition lies. Advocates, legislators, businesspeople, and lobbyists who don’t have a direct line to Cuomo or a long-standing alliance are often faced with that risky question of when to go at the governor with an aggressive public relations campaign. They can pay off wildly or they can put you on the governor’s bad side -- sometimes both. Business lobbyists say confrontational campaigns are their absolute last resort with any administration, but note that smaller issue-based groups don’t have a wealth of options at their disposal. Efforts to expand newer, technology-based businesses like Airbnb and Uber have set the stage for what some lobbyists say will be “heavyweight showdowns” with the well-established hotel trades and taxi lobbies, respectively. As Cuomo weighs whether to sign a bill that would be damaging to Airbnb, both supporters and opponents of the bill have struggled some with how to cajole him in their direction, especially around how much public pressure to mount. U.S. Attorney Preet Bharara’s investigation into the Governor’s economic development programs has put considerably more scrutiny on how lobbyists and those with business before the state use donations to get the attention of the governor and his closest allies. Fear over corruption was triggered because major developers, including two charged by Bharara, made major donations to Cuomo’s reelection campaign within months of winning major economic development contracts with the state. Bharara has also charged three of Cuomo’s allies with working to fix bids for the contractors they prefer. Cuomo has denied knowledge of the alleged arrangement and he has not been accused of wrongdoing, but it is his campaign that benefited. New York lacks the conflict of interest laws that limit campaign contributions from groups with business before the state. A July report by Politico New York showed that most of the donors to Cuomo’s campaign have business before the state, or interest in pending legislation. Cuomo has always claimed that he makes decisions on the merits. *Note: due to a mistake on the part of Gotham Gazette, attempts to reach the Cuomo administration for comment for this article did not reach the intended party. Cuomo's office should have been afforded to opportunity to respond to the questins at hand in this article, including certain allegations, and we apologize for the error. A prior note that indicated Cuomo's office did not respond to a request for comment was removed after it became clear that requests for comment did not reach representatives for Cuomo. After making this realization in communication with Cuomo's office, Gotham Gazette offered the Cuomo administration an opportunity to comment. We're about two weeks from New York's April 19 presidential primary vote. The three remaining Republican candidates and two remaining Democrats have been campaigning in New York, which is more in play than it has been in several cycles. Hillary Clinton is set to hold events in New York City and Albany Monday, including a rally with Gov. Cuomo and a meeting with state Assembly Democrats, and while the candidates are also paying attention to Wisconsin as the week begins, New York already has a great deal of their and the nation's focus. It should be an exciting and dramatic two weeks. As this week begins, the Clinton and Sanders campaigns continue to spar over whether there will be a Democratic debate in New York before the state votes. All three Republican candidates - Donald Trump, Ted Cruz, and John Kasich - are set to attend the New York GOP's annual gala, set for April 14. The candidates are expected to campaign in New York over the next two weeks. The day of the New York presidential primaries, April 19, is also the date of special elections in the state Legislature, including the races to replace both former Assembly Speaker Sheldon Silver and former Senate Majority Leader Dean Skelos. Both those races appear competitive two weeks out. The Senate race is especially important given that Democrats are eyeing this year's elections as a chance to take control of the chamber - they already have a wide majority in the Assembly. Monday will see return to a focus on the recently-passed state budget. Hillary Clinton will rally in New York City Monday with Gov. Cuomo and others to celebrate that the budget includes a path to a $15 per hour minimum wage and a paid family leave policy. There is sure to be more analysis of the $147-plus billion budget this week, it was passed Friday after much last-minute negotiating (a deal was announced just a few hours before the midnight Thursday deadline, with voting by the Legislature taking place through Thursday evening and into Friday - the state's fiscal year begins April 1). The new budget was met with some criticism, largely over the process by which it was agreed upon and passed with little time for review by lawmakers and the public, and much celebration, especially over the minimum wage and paid family leave provisions, as well as increased funding for education, transportation infrastructure, and more. There is a lot of budget language to digest as the details have been made public. The Legislature is due in Albany for three days of post-budget legislative session this week. Including this week, there are 27 days of session scheduled between now and its scheduled end on June 16. Issues to address include mayoral control of New York City schools, which expires at the end of June (the Senate will hold two May hearings, it recently announced, at which Mayor de Blasio is expected to testify), a property tax abatement program to spur affordable housing development (renewing or replacing the expired 421-a program), raising the age of adult criminal responsibility from 16, the Dream Act, and much more - including government ethics reform, which the governor says will be his top priority after none was included in the budget deal. On Monday we expect the City Council's official response to Mayor Bill de Blasio's $82 billion preliminary budget plan. The Council has held a month of budget hearings and now has the state budget to consider, so it is able to give its response to the mayor, who will take it and the state budget into account as he prepares his executive budget. 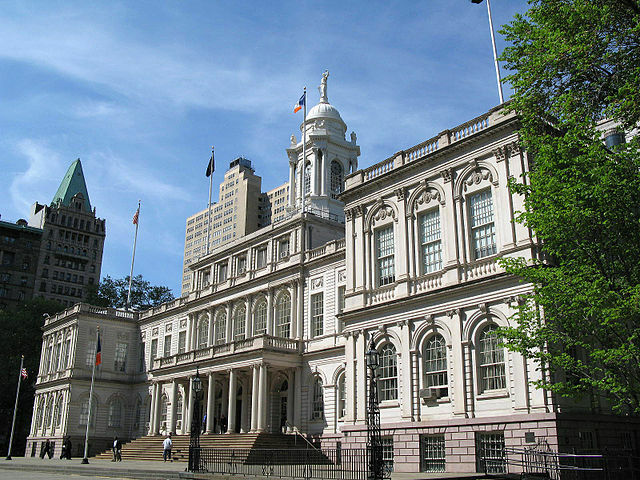 When de Blasio releases his updated spending plan in a few weeks, it will kick off another round of Council budget hearings as the two sides head toward a deal by the end of June and the July 1 start of the city's new fiscal year. Since major cuts in funding to the city from the state that Gov. Cuomo had in his budget plan were taken out of the final deal, there will be little drama to the city budget process the rest of the way. The biggest bone of contention appears to be whether the mayor is insisting on enough agency savings. There will also be small battles over things like levels of library funding. Many eyes are also on East New York as the week begins. A large area of the Brooklyn community is set to be rezoned, the first of 15 neighborhoods where the de Blasio administration plans to significantly change land use rules to facilitate more housing and community improvements, but the clock is ticking as the administration and local stakeholders, led by City Council Member Rafael Espinal, negotiate the final details of the plan. There is no zoning subcommittee or land use committee vote scheduled as of Sunday evening, but one could be scheduled if a deal is reached. The parties have until the end of the month to reach and pass a deal. Both houses of the New York State Legislature are in session on Monday in Albany. The City Council’s preliminary budget response to Mayor de Blasio is expected on Monday. At 11 a.m. Monday at the Javits Center in Manhattan, The Mario Cuomo Campaign for Economic Justice will hold a "victory rally for $15 minimum wage and paid family leave" - participants will include "Governor Andrew M. Cuomo; Hillary Clinton; George Gresham, President of 1199SEIU United Healthcare Workers East and Chair of the Mario Cuomo Campaign for Economic Justice; labor leaders; advocates and minimum wage workers." City Council Speaker Melissa Mark-Viverito is expected to attend the rally, according to her schedule. On Monday at 1 p.m. at 1 Police Plaza, "Mayor de Blasio and Police Commissioner William Bratton will host a press conference to discuss monthly crime stats," according to the mayor's public schedule. 10 a.m., the Committee on Transportation will meet to discuss several items, such as the provision of certain parking privileges for press vehicles, the requirement of curb extensions at certain dangerous intersections, and the establishment of Earth Day 2016 as a car-free day for private and all non-essential city vehicles. 10:30 a.m., the Committee on Rules, Privileges and Elections will meet to discuss various candidates for appointment to the Civilian Complaint Review Board, the Board of Corrections, and the City Planning Commission. 1 p.m., the Subcommittee on Planning, Dispositions and Concessions will meet to address several land use applications. 1 p.m., the Committee on Contracts will hold an oversight meeting on the challenges facing nonprofits in city contracting. At 11:30 a.m. Monday, schools Chancellor Carmen Fariña will visit "a Model Dual Language Program to make an announcement," at High School for Dual Language and Asian Studies in Manhattan. On Monday at noon, "At a press conference Monday, the New York City Environmental Justice Alliance will release a new report on Mayor de Blasio's OneNYC Plan, his administration's blueprint for increasing the city's environmental sustainability and resiliency. The report shows that six low-income communities of color on the waterfront designated by the city as Significant Maritime and Industrial Areas (SMIAs)—the South Bronx, Sunset Park, Red Hook, Newtown Creek, Brooklyn Navy Yard, and the North Shore of Staten Island—are still the most vulnerable to the threats of climate change and not sufficiently protected by the OneNYC Plan. A number of constructive recommendations for strengthening the plan are offered in the detailed report." At 5 p.m. Monday, Comptroller Scott Stringer will deliver remarks "at 32BJ Security Contract Rally" at the Wall Street Bull. At 9 p.m., Stringer will appear on BronxTalk with Gary Axelbank (BronxNet TV or Bronxnet.org). At 7:30 p.m. Monday in Albany, the burgeoning Museum of Political Corruption will host a roundtable discussion and public forum on political corruption following a reception and fundraiser. Speakers include Frank Anechiarico, professor of government and law at Hamilton College; Blair Horner, Executive Director of the New York Public Interest Research Group; Zephyr Teachout, Fordham Law School professor and Congressional candidate; Jimmy Vielkind, Politico NY Albany bureau chief; and Thomas Bass, SUNY Albany professor, who will moderate. Both houses of the New York State Legislature are in session on Tuesday in Albany. At 8 a.m., Bill Mulrow, secretary to Gov. Andrew Cuomo will discuss the administration’s budget goals and legislative priorities, including a $15 minimum wage, paid family leave, and infrastructure projects, at a Crain’s New York Business event. Moderating the conversation will be Crain’s New York editor Erik Engquist and Ken Lovett of the Daily News. At 10 a.m. Tuesday on the Upper East Side, the launch of LinkNYC Kiosks with free Wi-Fi and more, featuring City Council Member Ben Kallos, Assistant Commissioner Telecommunications Planning at NYC Department of Information and Technology Stanley Shor and LinkNYC General Manager Jen Hensley (86th Street and 3rd Avenue, South East Corner). At the City Council on Tuesday: at 10 a.m., the Committee on Immigration will address a resolution calling on the U.S. Supreme Court to issue a decision in U.S. v. Texas, which overturns the Fifth Circuit’s ruling and upholds the implementation of President Obama’s expanded Deferred Action for Childhood Arrivals (DACA) and Deferred Action for Parental Accountability (DAPA) programs. At 2 p.m., a town hall meeting to discuss the 2017 referendum to hold a New York constitutional convention will be held at the University at Buffalo. The event will feature a number of experts, such as Gerald Benjamin of SUNY New Paltz and Henrik Dullea, who served as director of state operations and policy management for Governor Mario Cuomo from 1983-91, who will discuss what a constitutional convention would look like and the issues at stake in constitutional reform. At 6 p.m., The Coalition to End Broken Windows will launch a two-day conference, Breaking Broken Windows, at the CUNY Graduate Center. Participants will evaluate, debate, and debunk Broken Windows policing theory, which “contends that policing disorder leads to reductions in serious crime.” They will also analyze the era of mass criminalization and imprisonment while working towards alternative solutions for a better future for New York City. Speakers include a variety of academics, advocates, and journalists, including Noha Arafa, of New Yorkers Against Bratton, Janine Jackson of Fairness & Accuracy in Reporting, and Professor Alex Vitale of Brooklyn College. Tuesday at 6:30 p.m. in Queens, "City Council "Majority Leader Jimmy Van Bramer and Access Queens will host a Town Hall on the 7 train with New York City Transit President Veronique "Ronnie" Hakim. At this event, 7 train riders, angry and frustrated by seemingly endless delays, overcrowding, and weekend and evening closures, will have the opportunity to ask questions and share concerns directly with the president of New York City Transit." Both houses of the New York State Legislature are in session on Wednesday in Albany. The Manhattan Institute and the Fordham Institute will host a conference beginning at 8:30 a.m. Wednesday to address “The Future of Charter Schools—And School Choice—In NYC,” following a recent study ranking U.S. cities on various school-choice metrics (by the Fordham Institute) finding that local political support for charters in NYC has fallen from 8th to 26th place, and the city’s overall ranking from 3rd to 12th. Speakers include Priscilla Wohlstetter, professor at Teachers College, Columbia University; James Merriman, president of the New York City Charter School Center; Michael Petrilli, president of the Fordham Institute; and Charles Sahm, Director of Education Policy at the Manhattan Institute. 10 a.m., the Committee on Public Safety will meet to address several resolutions on Nicholas’ Law, the Public Safety and Second Amendment Rights Protection Act, Congressional funding for gun violence research, safeguards against wrongful convictions, and opposing the Constitutional Concealed Carry Reciprocity Act. 11 a.m., the Committee on Economic Development will hear a bill requiring a survey and study of racial, ethnic, and gender diversity among the leadership of city contractors. 11 a.m., the Committee on Land Use will meet to address several issues deferred from the meeting of the Subcommittee on Zoning and Franchises and the Subcommittee on Landmarks, Public Siting, and Maritime Uses. 1 p.m., the Committee on Governmental Operations will meet to evaluate the structure and content of the preliminary Mayor’s Management Report. On Wednesday at 11 a.m. in Albany, "State Senator Liz Krueger will hold a forum on modernizing sales tax collection in New York State. New York State's current system of sales tax collection has not kept up with changes in retail payment methods and technological innovation. This forum will evaluate proposals for modernizing the collection of sales tax to improve its efficiency for retailers and to reduce the potential for fraud through sales tax suppression. One tax researcher has estimated that sales tax suppression costs New York State $1.7 billion in revenue annually. A number of other states and countries have adopted or are exploring the adoption of new technologies to address these issues." At 6:30 p.m. Wednesday, the Brooklyn Historical Society will host a panel to discuss “Moving Beyond the Rhetoric: Creating a Diverse Workplace in the 21st Century.” Panelists include professionals leading Bloomberg LP’s Diversity and Inclusion group; Kristen Titus, Founding Director of NYC Tech Talent Pipeline; Anthony Crowell, President of New York Law School; Eulas Boyd, Dean of Admissions at Brooklyn Law School; and Tom Finkelpearl, Commissioner, NYC Department of Cultural Affairs” and will discuss their experiences in building and instituting workplace diversity policies. 10 a.m., the Committee on Finance will meet to address a land use application and introduce a bill establishing a temporary program to resolve outstanding penalties imposed by the environmental control board. 1:30 p.m., the City Council will hold a full-body stated meeting, which will be prefaced as usual by a pre-stated press conference hosted by Council Speaker Melissa Mark-Viverito. 10 a.m. in Albany, the Assembly Standing Committee on Insurance and the Assembly Standing Committee on Health will be hosting a public hearing to evaluate the process of modifying or enhancing health insurance coverage requirements under the Affordable Care Act. Noon in Oakdale, the Senate Joint Task Force on Heroin and Opioid Addiction will host a public meeting to examine the issues facing communities in the wake of increased heroin abuse. At 5 p.m. Thursday, the MTA will hold a public hearing about a proposal to restore service to the N and Q lines in connection with the opening of Phase I of the Second Avenue Subway, expected to be completed late this year. U.S. Attorney for the Southern District of New York Preet Bharara is scheduled to deliver the keynote speech at the New York Press Association Spring Convention, which will begin at 9 a.m. Friday. At 9:30 a.m. on Saturday, Staten Island Borough President James S. Oddo will join the ROLE Call in hosting the NYC Fatherhood and Family Enrichment Conference at Port Richmond High School. This event aims to enhance Fatherhood Engagement by offering seminars and workshops in family and fatherhood services. So far, New York politics in 2016 looks a lot like 2015. On Sunday, Gov. Andrew Cuomo announced a new Executive Order related to homelessness that appears to be the opening salvo in his plan to take aim at the issue, most pressingly in New York City, where he's criticized Mayor Bill de Blasio's handling of the crisis that includes about 60,000 homeless people. Cuomo's order notes that homelessness is a problem around the state and says that when temperatures are below freezing, municipalities must provide shelter to homeless individuals, move homeless people to shelter, extend shelter hours, and maintain quality shelter conditions that meet state and local laws and regulations. The move gets at the rivalry between the governor and the mayor, which shows little sign of abating, despite the fact that there are real policy issues - and lives - at stake. De Blasio has battled a persistent homeless census, issues with the conditions of homeless shelters, and a good deal of criticism from the governor and others, which has all led to a shake-up in his administration. To fight homelessness, de Blasio has enacted a good deal of new policy and drastically increased funding toward a variety of programs, but he has only just recently been able to level off a growing number of people without consistent housing. On Sunday, the de Blasio administration was quick to point out that the governor's executive order does little, if anything, to change things in the city, which already has a must-shelter law and where the city recently announced new protocols for shelter hours and services. There is one main point of contention, though, which is the order's provision that homeless individuals must be moved to shelter - something the de Blasio administration says can only be mandated through state law. De Blasio is sure to get questions about these issues when he holds a press conference centered around another topic Monday morning in Brooklyn - see below for details. Cuomo, meanwhile, is gearing up for his January 13 State of the State and budget address, which is likely to include other policies aimed at homelessness. Cuomo is set to make an announcement on Monday in Manhattan - see below for details. The state Legislature returns to Albany for its first session day of 2016 on Wednesday of this week. There are legislative hearings on the minimum wage and the failed Health Republic insurance exchange this week - see below for details. On Monday at 7:15 a.m. outside Barclays Center in Brooklyn, "Mayor de Blasio, Senator Charles Schumer, elected officials and senior Administration leadership will meet morning commuters...to pass out flyers on the City's new commuter benefits law. Tomorrow is the first work day after the law went into effect on January 1." Read about the new transit benefit laws here: New Transit Program Called 'Win-Win' for Many Commuters and Employers. At about 7:30 a.m. inside Barclays Center, "the Mayor will hold a press conference to discuss commuter benefits." Then, at 1:30 p.m. Monday at One Police Plaza, de Blasio and NYPD Commissioner Bratton "will hold a press conference to discuss historically low crime numbers in New York City." At 11 a.m. Monday at 1199 SEIU headquarters in Manhattan, Gov. Cuomo will make an announcement, kicking off "The Mario Cuomo Campaign for Economic Justice." City officials, including Comptroller Scott Stringer, will attend. At 6:30 p.m. Tuesday, City Council Members Dan Garodnick and Rosie Mendez will co-host a community town hall focused on "Homelessness on the East Side" at the Parish Hall of the Church of the Epiphany. A variety of other Manhattan elected officials are also co-sponsoring and will either attend or send representatives. The New York State Legislature holds its first day of 2016 legislative session in Albany on Wednesday. At 9 a.m. on Wednesday in Albany, the Senate Standing Committees on Health and Insurance will hold a public meeting about "The demise of Health Republic and preparing for the future." At 9:30 a.m., the Committee on Housing and Buildings will meet about a resolution calling on the city and state to sign a fourth New York-New York supportive housing plan. At noon, the Council will hold the year's first Stated Meeting. As always, this is expected to be prefaced by the Council Speaker's pre-stated press conference. At 8:30 a.m., Senator Charles Schumer "will discuss Congress' year-end budget and how it impacts New York" at an Association for a Better New York breakfast event. At the City Council at 10 a.m. Thursday, the Committee on Aging will meet for an oversight hearing about social adult day care. At the state Legislature on Thursday: an 11 a.m. public hearing in Albany held by the Senate Standing Committee on Labor to analyze "the overall impact increasing the statewide minimum wage to $15/hour would have on workers, employers, and the state as a whole." Nothing on our radar right now, but that can easily change as events are announced once the week gets going. Stay tuned for updates here and elsewhere. On Friday, tenant advocates, union representatives, and elected officials gathered in two separate meetings to discuss the renewal and strengthening of state rent laws. There is a sense of urgency among city-based legislators and tenant advocates as the laws regulating many thousands of apartments are set to expire in six weeks and legislative debate on the topic is non-existent. One meeting took place at the United Federation of Teachers (UFT) headquarters in New York City and featured Mayor Bill de Blasio, union heads, and key electeds like Assembly Housing Committee Chair Keith Wright of Harlem. According to numerous sources the meeting was convened by 1199 SEIU, the powerful healthcare workers union, to convince organized labor to join the fight to strengthen the rent laws. Meanwhile, another group of advocates and legislators met in Yonkers in the office of Assembly Member Shelley Mayer to discuss how to get equity between the city and suburban rent laws and how to mobilize tenants on short notice. Many legislators and advocates worry that the meetings took place too late in the game. There's just six weeks left in legislative session and the rent laws have been the subject of few negotiations and almost no organized lobbying. Stakeholders see this year as do or die for strengthening rent laws so that landlords can't remove apartments from rent regulation after making renovations and increasing rent. Advocates say 54,000 apartments have been taken off the roles in the past 10 years - a figure they cite as a net total. Landlords insist the current rules help them maintain apartments and keeps the housing stock from falling into complete disrepair - they do not want to see it become tougher for them to move apartments to market rate. Meanwhile Senate Republicans are distracted by the corruption investigation into and impending charges against Majority Leader Dean Skelos, and eager to frustrate their nemesis de Blasio, who is seeking renewal of mayoral control of schools and the rent laws before both sunset in June. Tenant advocates are investing all of their hope in new Assembly Speaker Carl Heastie, Democrat of the Bronx, and are demanding he play hardball in negotiations over the renewal of the 421-A tax break that benefits developers and expires at the same time as the rent laws. Gov. Andrew Cuomo has already downplayed the possibility of useful negotiation in the Legislature. 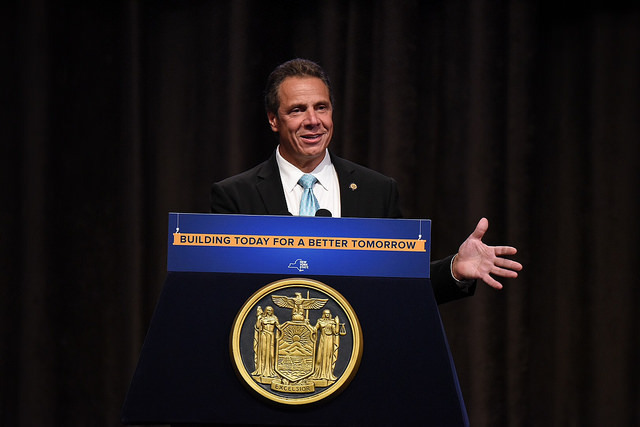 Back from his visit to Cuba, an energized, punchy Cuomo delivered an assessment of the current rent law negotiations to a breakfast of the Association for a Better New York on April 24. "If it was a different time in Albany, frankly, and Albany was a little bit more of a stable situation I would normally take those negotiations to Albany and try to work it out among the parties," Cuomo said of the housing-related issues. "Albany is somewhat - there's a lot going on right now. So I'm hoping and I'm asking the parties to work out the disagreements among themselves." He then suggested that the situation in Albany might be so dire that a straight extension of both programs, without any tinkering, might be necessary. That was the last thing tenant advocates wanted to hear. "I thought it was outrageous," said Michael McKee, treasurer of Tenant's PAC. "He was proposing exactly what the real estate industry wants." McKee was further vexed that no legislators challenged the assertion that Albany is too dysfunctional to negotiate over two essential pieces of legislation. "Why was there no blowback?" asked McKee. The influence of the real estate industry in Albany is well-documented, of course. Advocates plan on turning up the pressure in the coming weeks. Cuomo's Manhattan office will be the center of protest on Wednesday, May 6 at 11 a.m. and New York State Tenants and Neighbors will host a rally in Foley Square at 5 p.m. on May 14. A number of legislators also have tentative plans to make public pushes for strengthening the rent laws. What do advocates want? They say the city has those 54,000 rent-controlled units over the past 20 years thanks to vacancy decontrol. Current state law allows landlords to increase rents based on improvements they make to a building or individual apartments. Some tenants find their rents increasing without any obvious fixes being made. 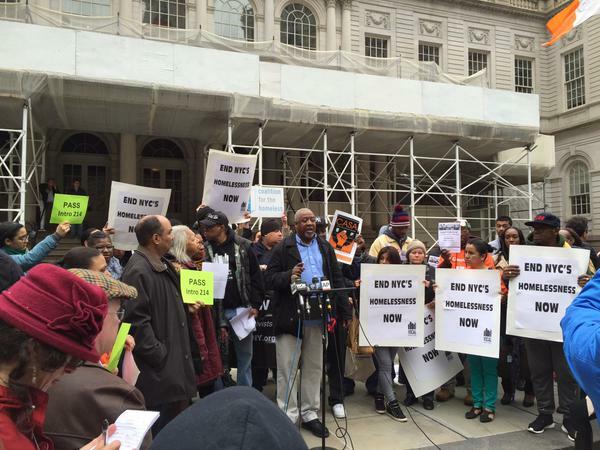 Landlords can also increase rent by 20 percent once a rent-stabilized tenant leaves. Tenants claim this leads to abuse from landlords who want to increase rent. The Rent Stabilization Association (RSA), which represents landlords, insists that landlords make improvements that are necessary and that without them the housing stock deteriorates. Landlords face increasing operating costs like water and sewer fees. Frank Ricci of the RSA said he praised the current laws, especially considering the challenges landlords face. "I think all those laws work very well," said Ricci. "They inject needed capital into the housing stock. But that does not mean Ricci is happy with a lack of legislative discussion over the rent laws "There hasn't been a rational healthy debate on the issue for years. It is owners versus tenants. The Assembly gets very wrapped up in representing tenants. They aren't worried about what keeps the housing stock going." There are differing proposals for how to improve rent control for tenants and it is unlikely any individual bill proposed in the Legislature will become the solution as a bill package will almost certainly be hashed out in secret by Cuomo and the leaders of each house. But a few of the ideas include limiting landlords' ability to increase rent after repairs so that once the repairs are paid off rent would return to a baseline. There is also talk of ending vacancy decontrol and stopping landlords from being able to increase rent by 20 percent once an apartment becomes vacant. Renewal of the rent laws almost certainly won't happen this year without renewal of 421-A, a tax break for developers that has been under the spotlight lately in part thanks to the indictment of former Assembly Speaker Sheldon Silver, who allegedly used his leverage over the breaks to push developers to hire a law firm which in turn gave him kickbacks. There are also questions about whether 421-A is still necessary as an incentive to spur development in a booming city. But, the tax break is designed to incentivize developers to include affordable housing in luxury high rises. Tenant advocates say the costs of the break far outweigh the benefit, though: the city lost $1 billion in tax revenue to the exemption in 2014 according to a study by the Municipal Art Society of New York. Advocates estimate that fewer than 16,000 families benefited from the creation of affordable housing under 421-A last year. Some legislators have proposed replacing the program with a housing voucher system so that families would directly benefit. It is dubious to think that Senate Republicans will let 421-A go when the real estate board, also known as REBNY, and developers are their single largest campaign donors and Senate Republicans don't have a very large wish list for the end of year. Governor Cuomo is also a very large beneficiary of the real estate industry, as are many other Democrats. Further, some in the real estate industry insist that de Blasio needs 421-A to implement his ambitious city affordable housing plan because he is relying on real estate powers to implement it. His plan calls for the creation over the next decade of 80,000 affordable units, the preservation of 120,000 affordable units, and the development of 160,000 market-rate units.The mayor's office did not issue any details of Friday's meeting and did not respond to request for comment in time for publication. Activists and legislators say the mayor should simply get behind a new plan that relies on a program replacing 421-A, but with the rent laws expiring in June and Senate Republicans running down the clock it appears unlikely that 421-A is going anywhere.